Pop’s Story | The Happy Wonderer ~ ellen b. The next day we went to the city of Guran in order to buy the wedding necessities. When we were there, Nadia’s father pulled me aside and said, “Moisi, since we’re here in the city why don’t we make a quick trip to the doctors and have you checked out as to whether you can father children or not.” I was again so embarrassed that I was looking for the proverbial hole to jump into. I answered, “Listen, if you’re not willing to accept me the way I am, let’s just forget about the whole thing and go back home.” (Ironically we had nine children – more than anyone else in my family). The fact that I was thoroughly offended got through to him and he backed off. And so we bought the necessary supplies for the wedding and went to work on the preparations. We were married sometime in July but I am not sure of the exact date. The very first Sunday after our wedding, we were on our way to church. We had to pass the Baptist church to get to the Molokan church. As we came abreast the Baptist church, Nadia said, “Let’s go in.” I declined saying that we should go to the Molokan church. We literally stood there for an hour arguing as to what church we should attend. We finally ended up just going back home. Why the argument? I was told I was to be the man of the house. I was told not to forget the religion I was brought up in with its traditions. I was told that if I attended the Baptist church, they would pressure me to be baptized and that would seal my doom. So I was afraid of attending that church. Our first years together after marriage were not too pleasant because of our disagreement over religion. Nadia’s faith was personal while mine was not. We lived in Iran for four years after our marriage – two years in Rakhmanabad and two years in Teheran. Our marriage improved somewhat in Teheran because I worked Sundays. This allowed Nadia to attend the Baptist church which blunted the sharp edges of our disagreement. I worked first for the American military and then for the Russian military as a mechanic. Lastly I worked for a brick factory also as a mechanic. Somehow when my parents filled out their legal papers coming into the U.S. they chose September 13th as their marriage date. 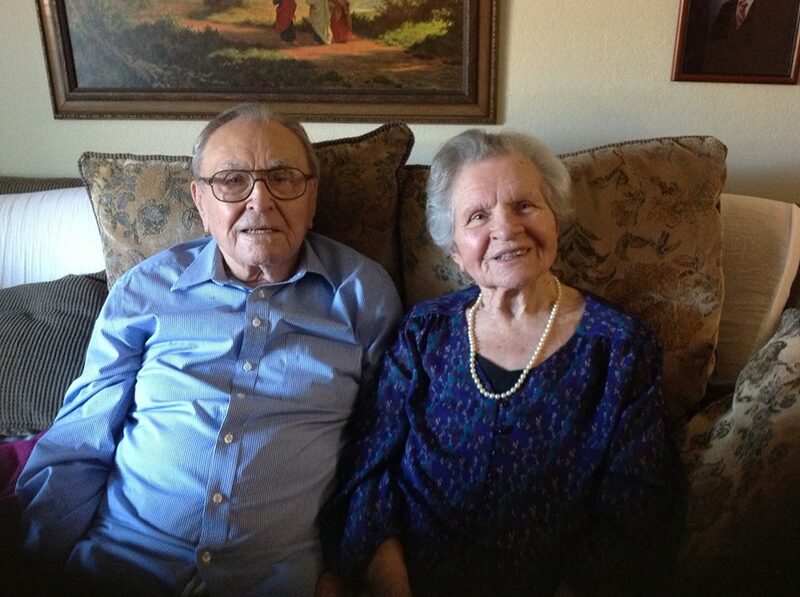 We celebrated that day and our mom died on my parents’ 70th wedding anniversary, September 13, 2013. This photo was taken a month before our mom left this earth. The photo above of this group of Molokan leaders was taken in Los Angeles in 1933 before my parents immigrated to the U.S. It is not my photo. I believe they were walking to the church in the photo below to dedicate it’s formation from three separate churches. After church on the first Sunday that he was in our village, Nadia’s cousin came up to me with a note. It read “I want to meet you and talk with you.” I knew immediately who it was from. And so I trudged up the road to where he was staying – my knees barely supporting me. We greeted each other. Almost immediately he said, “Let’s take a walk. I want to discuss a few things.” Then he launched into what he wanted to talk about. “I’ve heard that you are not really a good candidate for marriage. In addition, I’ve also heard that you are not able to have children. And children are definitely a blessing.” These words made me so uncomfortable that I wanted to jump into a hole in the ground and pull the hole in after me. I answered, “I don’t know what the future holds. All I know is that I love Nadia and I want to marry her.” I think it was then that he understood that I was determined to see this through. What about the wedding details was his next question. (Molokans do these things differently than Baptists.) I answered, “That is an issue we’ll discuss with my parents. But one way or another we love each other and we definitely want to get married.” With that, our conversation ended. I went home and ate lunch. After lunch Nadia and I met in the fields. When I saw her smiling face my heart jumped with joy because her smile signaled her father’s acquiescence. Both sets of parents then met each other and discussed the details of the upcoming marriage, namely who was to do what and how it was to be paid for. The first order of business was the engagement ceremony. This was to be done according to Molokan custom. It was hosted by my parents at their home a few days later in the evening. The ceremony was basically a prayer gathering of invited guests, asking God to bless the upcoming marriage and then ending with a reception. And so the guests came, sang, and offered messages of encouragement based on Biblical teaching. After that all took place Nadia and I made our way to the center of the room where hands were laid on us and we were to be prayed for. To begin the actual prayer ceremony, Nadia and I asked that all in attendance would pray for us – specifically that God would bless our marriage. We then knelt and the Molokan pastor prayed for us. He was a gifted orator and his prayer was a shining example of that. To such a degree that one of the Molokan prophets jumped in response to the inspiration of the prayer. But this jumping was specifically not to be allowed according to the agreement reached by Nadia’s father and my parents. Jumping was anathema to Nadia’s father – a staunch Baptist. As soon as he heard the thump of the jump, he reacted immediately. “Up, Nadia! They’ve lied to us. Let’s go!” Nadia was ready to do so but she was firmly held down by my mother until the prayer was over. When it did end, Nadia, her father, mother and all their invited guests left for her aunt’s home. As he was leaving, Nadia’s father kept repeating that he was deceived – the decibel level of his voice certainly not being on the low end of the spectrum. Only the guests of my parents remained. I walked outside and was so distraught that I seriously contemplated leaving this whole disastrous scene by taking the first means of transportation out and never coming back. As I was standing there thinking about it, I happened to notice the position of the moon. It was just on the horizon. I had never seen it so close before. And then I felt a hand on my shoulder and a quiet voice in my ear, “Moisi, whatever you are thinking – don’t do it. Go to Nadia’s aunt’s house and be with Nadia. Her dad will calm down eventually. Everything will be OK.” It was the voice of John Federov. I took his advice and went to the house, walked in and was greeted by a high level of commotion. The decibel level of Nadia’s father’s voice had increased significantly but his message remained the same – “They lied to us. They didn’t keep their word.” The others in the room were trying to calm him. I saw Nadia sitting on a trunk crying. Nadia’s mother went over to her and scolded her, “You got us into this and you’re the one crying about it? Shame on you!” That made Nadia cry even more. I went over and sat next to her and began crying myself. After a while Nadia’s father did calm down. They talked him into going back to the festivities which were just beginning when we got there and it all ended without further incident. 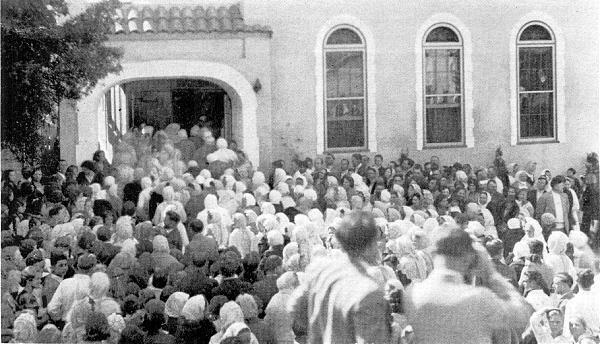 In 1933 the First United Christian Molokan Church was dedicated in their new building on 3rd street in Los Angeles. I believe 3 congregations combined to form this church that was called “Big Church”. In l941 the First United Christian Molokan Church relocated to Lorena St. in East Los Angeles. The new church looked a lot like the photo above. This was the location that our family attended and that we became familiar with. Now the new location for this church is in La Habra. Our grandfather was a preacher/elder at this church after he immigrated to the U.S. There are several Molokan churches in California and some in Oregon, Arizona. Each church has it’s own signature. Many traditions are the same and some are becoming more different from each other because there are no governing bodies or conferences amongst them. Each location is autonomous and as older members die off things change. I’m guessing Big church got that nickname because it was one of the bigger congregations. Some Molokan churches follow a prophet named Maxim and they are “Jumpers”. Certain members in the church when becoming “spirit filled” jump in response. Other Molokan churches don’t jump. As a young child in the church I was always shocked and mesmerized by these jumping episodes, usually occurring at a crescendo or certain stanza of a Psalm being sung. 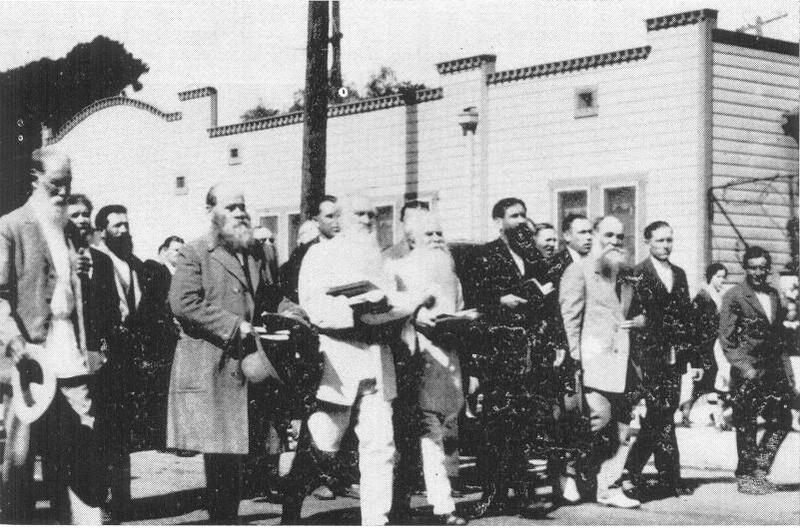 I’ll share more about Molokans and Russian Baptists in later posts and about the small group of Molokans who broke off from Big Church to form Kern Avenue Church. 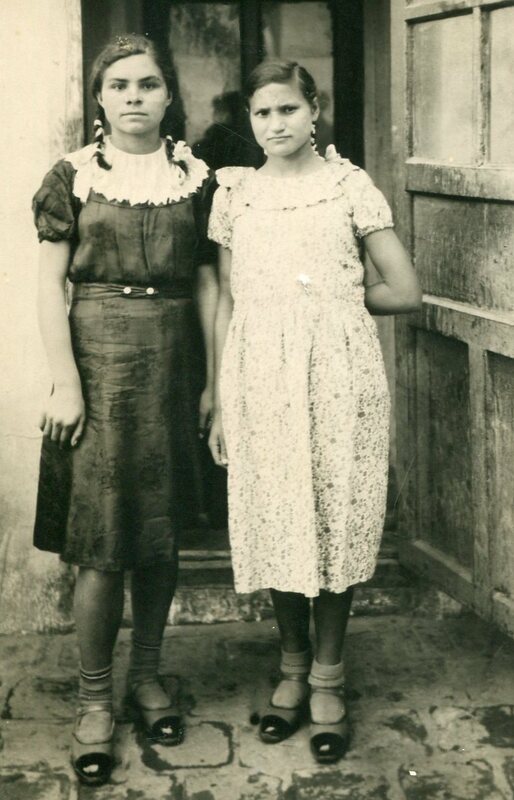 Our mom with her cousin Luba. Nineteen forty-one saw the start of World War II and as a result, demand for wheat grew and we began to prosper. In 1943, I began to seriously think of marriage and started looking for a suitable mate. One of my sister’s-in-law came from Teheran to give birth in our town because her mother was there. I was assigned the duty of escorting her and her baby back to Teheran. When I was there I became acquainted with the local young people. Two girls among them caught my eye – Nina Katkov and Nadia Shvetzov. At that time I mentally picked Nina for myself and Nadia for my friend. Of course this was unbeknownst to them and so I returned home and told my friend of all that had transpired. Our Mom in the 1940’s. 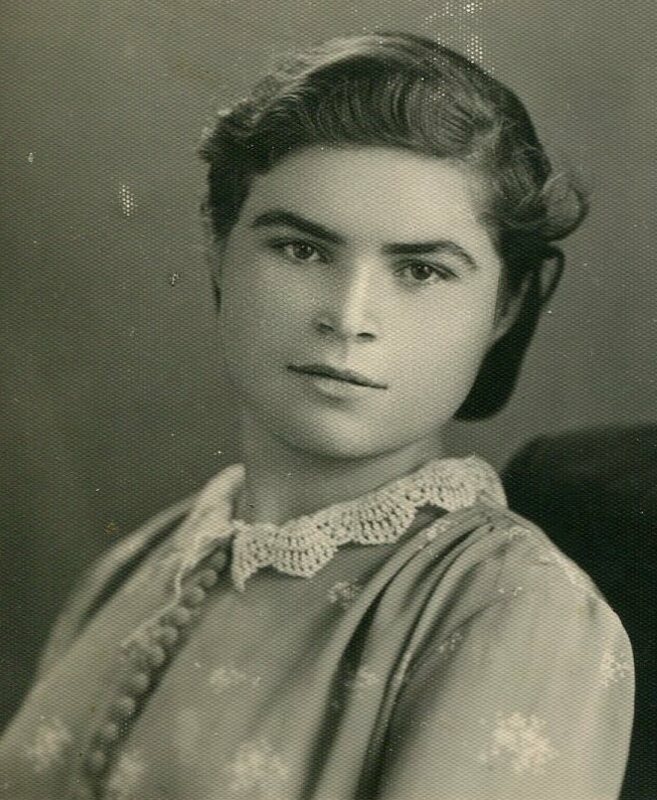 In May of 1943 the harvest was just beginning and it just so happened, within a few weeks of my return home, that Nina came with her folks and Nadia with her mom to participate in the harvest. This suited me just fine. The day they came, I happened to be at home and not in the fields because I had hurt my leg. Their first stop upon arrival was our neighbor’s house. They came outside to wash up a bit after their journey – there was no indoor plumbing in those days. I went next door, brought water from the well and poured it on their hands. Out came Nadia from the house, extended her hands to be watered, and smiled at me. That was it. Her smile rendered Nina a distant memory. 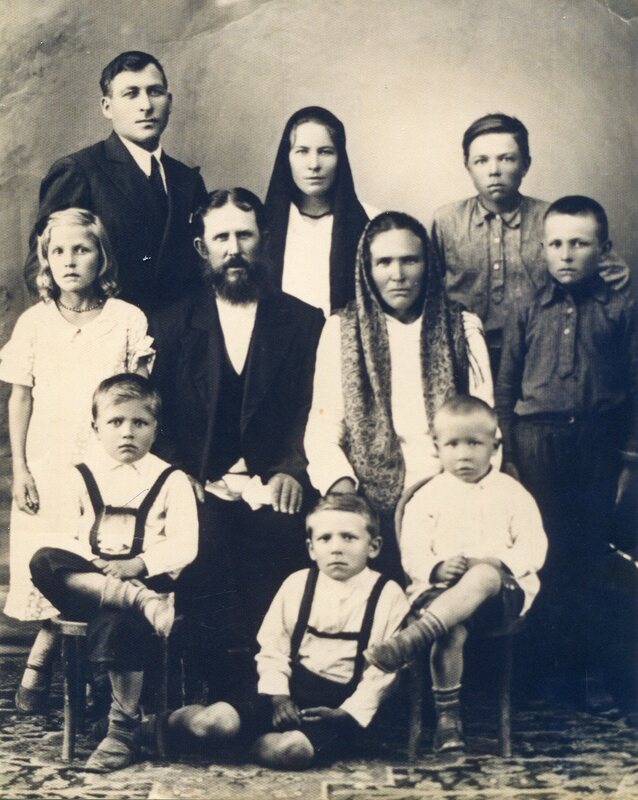 During the harvest, about four or five families worked as a group. Lots would be cast as to what order each farm would be harvested. Each group worked for a specific farm. The owners would feed us, and in general the work was quite pleasant. Since many of the workers were young singles of marriageable age, serious courting took place in the evenings. Protracted individual dating was unknown back then. In those two summer months following that particular harvest, twelve marriages took place. I remember that some of these marriages did not do well primarily because of the immaturity of both bride and groom. 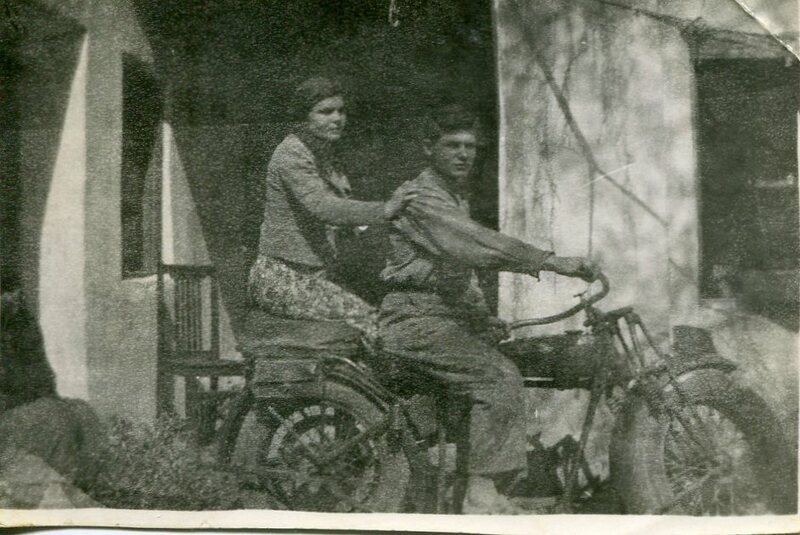 This is our mom with her brother Paul in Persia before she and Pop were married. 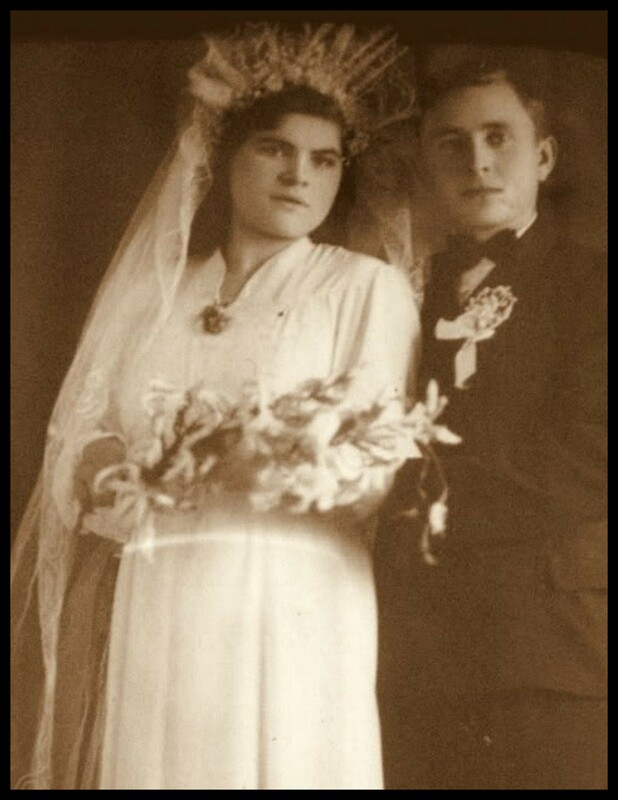 Our mom’s brother Paul ended up marrying Nina and the next photo is from their wedding which occurred after my parents immigrated to the United States. I’m including this photo since Nina was mentioned in this part of Pop’s story. Nina ended up being our pop’s sister-in-law, our aunt. In Persia on wedding days one of the customary photos taken was of the couple that just got married with all their single relatives and friends. 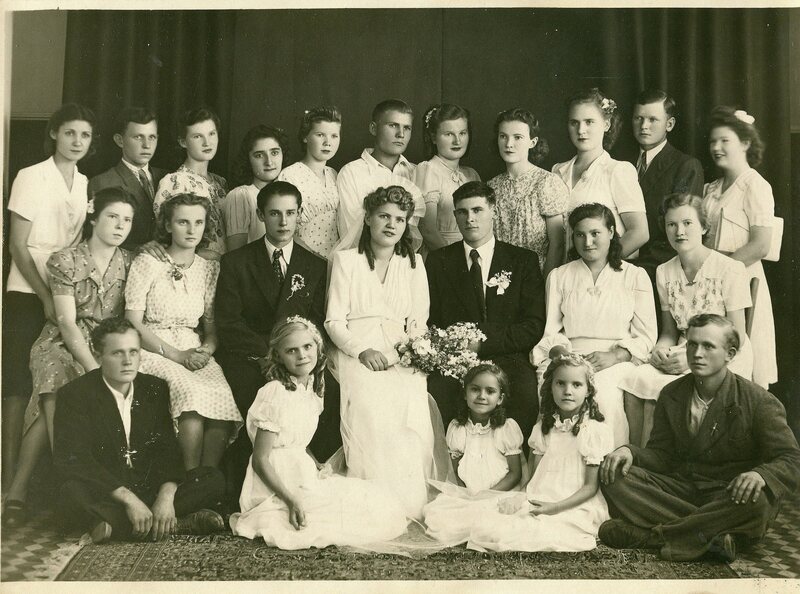 Next to my uncle Paul is Luba who is also in the top photo with my mom when they were younger. This is our Pop’s story dictated verbally by him a few years ago. I’ll be sharing excerpts every Tuesday. When I add to his story or explain a photo I will Italicize my words. Our Pop’s words will not be italicized. Our mom does not come into Pop’s story until “Tuesdays With Moisi ~ 9” even thought I’ve posted photos of her before #9. 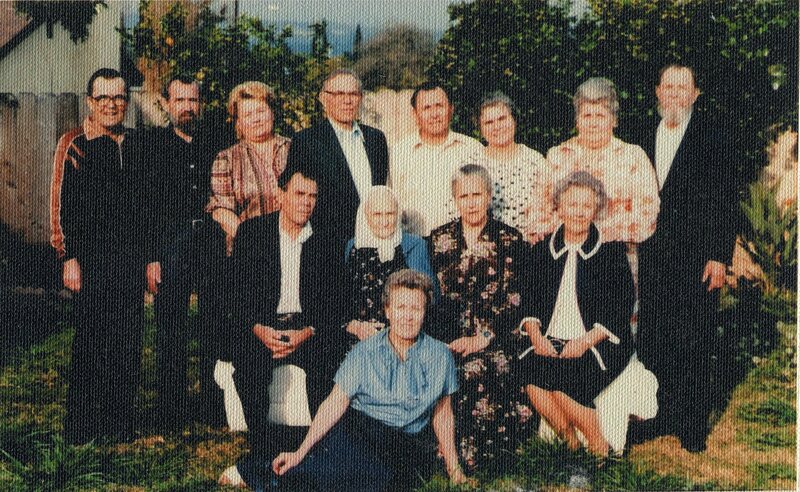 I have very few photos from our parents’ life in Russia and Persia. At the end of my Tuesday posts I’ll add links to all the other posts. 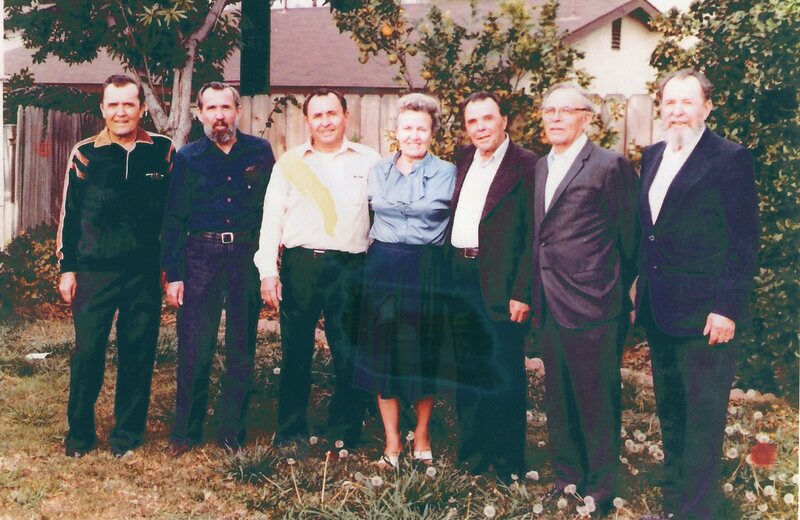 My paternal grandfather is in the gold and black shirt with his red bear waning and filling in with grey. My dear paternal grandmother is next to our Pop. Pop’s sister and her husband are on the right. 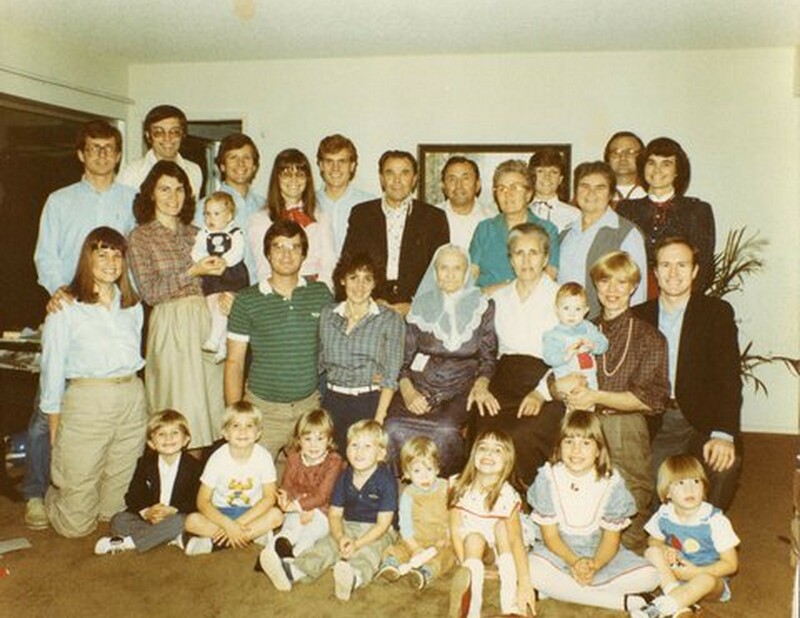 This photo was taken at our home in La Mirada in the USA in the 1970’s. 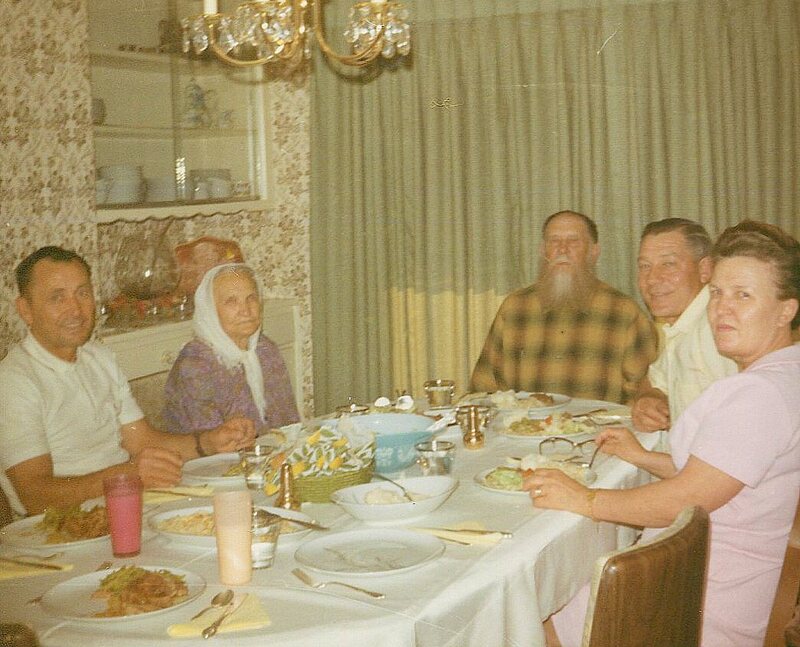 Red Beard, Timofey, my paternal grandfather died July 23, 1979, the year our first son was born, he was 91. Martha, my maternal grandmother died inJuly of 1986, she was 98! Our pop’s sister shown here is the last remaining member of the family alive. About two or three hours later we came to the town of Sherevan just before sunset. Some of the townspeople came out with bread for us. We were so thankful for their generosity. We were directed to a motel for the night. But shortly thereafter, border guards came to the motel and took us all to the local police station in order to start the process of deporting us back to Russia. We did not know this at the time. But then at that moment, a truck happened to arrive at the station. The driver saw us and asked, “Whose family are you?” My mom answered, “Bagdanov.” He said, “Do you know that they are planning to send you back? But don’t worry, I’ll take care of it.” He then went to the town mayor and asked, “Do you know whose family you’re sending back? It’s Red beard’s family.” (My father had a rather prominent red beard.) The mayor immediately released us back to the motel, gave us a large room and brought us food. Later on that night my father came with a loaded truck (he was in the delivery business). The next day he delivered his load and came back for us. We then headed for the town of Meshed where my father was living while he was waiting for us. If you want to read the rest of the story you can search my Tuesdays With Moisi posts. Not too long after this, the father-in-law of my brother John showed up on our doorstep. His name was Sofely Sisoyev. He told us to be ready by the end of October because he would be our guide in our escape to Iran. He then left for Azerbaijan to collect his family and bring them back to Iran. Again by God’s grace, my brothers were given another roofing job and so we were able to buy provisions for the journey. Then Mr. Sisoyev returned with his family as promised. We all left the evening of November 6, 1933. We walked all night, reached the Iranian border and crossed it. We hid during the day. On the second night we were unfortunately accosted by a gang of Kurdish thugs. They robbed us of all we had and raped my brother John’s wife. (She was impregnated as a result, but died months later in giving birth.) And so we were left with nothing but the clothes on our backs – no food and no water. During the following day, we hid. Even though we were not walking or active during the day we were still hungry. On the third night of our journey we became very tired and very hungry. We approached a Kurdish village, knocked on doors and begged for food. One family had mercy and gave us bread and raisins. We were able to pay them for it because we had some money hidden in a belt underneath my nephew Alex’s diaper. It had escaped the attention of the Kurdish gang that had robbed us. By this time we were quite a distance from the border. Uncle Sofely told us to take a certain road that would take us to where we needed to go. He then separated from our family and his. The reason for this was self protection. He did not carry any ID – either Russian or Iranian. If we were for some reason apprehended, he would be identified as the guide and would be arrested. He reconnected with his family later. So our group continued on – all fifteen of us. There were seven adults and eight children. 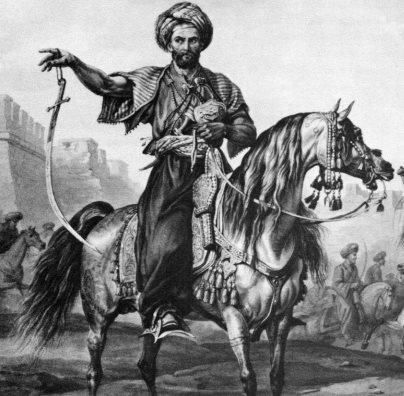 Around twelve noon on the 9th of November, a man on horseback overtook us, looked us over and rode on. We walked on for another hour or so. All of a sudden, there he was to our right, about 250 feet away, underneath a tree. He motioned us to come to him. As we drew closer we could see a rug on the ground loaded with bread, grapes, raisins and lady fingers. We all started to cry and literally knelt before him in gratitude. He motioned us to sit down and eat. Before we began eating we prayed. After we ate we rested for a short while. When we were ready to resume our journey, we were given specific directions as to how we were to reach our destination. We again knelt before him in gratitude and started on our way. If you missed any of the story you can find parts 1-5 in older posts.